Doing a distribution upgrade always makes me feel uncertain. 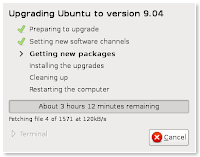 I used to use another flavour of Linux that was very poor at upgrading. In fact, every time I tried to upgrade between versions it broke. I ended up doing a clean install every time there was a new version. 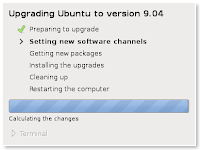 Since switching to Ubuntu I have not had that problem, but I must be scarred from my previous experiences because I still get uneasy about upgrading. I have even waited to make sure that other people can do successful upgrades. 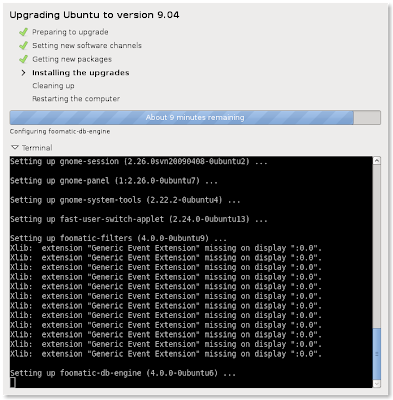 U buntu makes it dead simple to perform a distribution upgrade. All one really needs to do is to run update-manager. Generally this runs each time after you start up to check for upgrades but you may have disabled that. Once the program finds that there is a new distribution there is a button that can be pressed to perform a distribution upgrade. Even though the upgrade is seamless I suggest making a backup before you perform the upgrade. You should see some similar screens on your computer that I have posted here. You pretty much let it work and at the end it will want you to reboot. If you have a successful reboot then the upgrade went fine. If you had some issues then you may want to check out the Ubuntu forums or try to google it.